Home / Articles / 2018 / Market View: Are Your Marketers Competent? I was listening to an interview with Billy Joel where he was asked how he was able to have had so many hits over so many years. His answer was simple, “I’m competent.” He said he really understood every aspect of the music business from singing and song writing to editing, producing and performing. As usual, this made me think about the food industry and wonder if one reason so few new products are successful and sales in general are flat is because the people are not “competent.” And I mean the “Billy Joel” sense of competent. How many food marketers are really competent and know every aspect of the business? My personal experience is that not many people really know food marketing from A to Z. I am ready for all the emails, but I think many of the people in food marketing operate in a silo where they may be very competent but not really knowledgeable outside of that area. Almost everyone seems to be well skilled at the specific tasks they are currently doing. I think missing the “big picture” of marketing often leads to inefficiency and a sense of working against the consumer and not for the consumer. Where might brand managers learn about the A to Z of marketing? A first choice might be universities or an MBA program. As many of you know, I am a vocal critic of most traditional MBA programs. An MBA program is a “general” business degree where a broad spectrum of courses and topics are covered over the course of study. In well-respected MBA programs, the maximum number of courses you can take in any one field is two or three. You don’t become an expert in marketing by taking two MBA courses. O f course, you can take an “executive MBA” in a year or less. I’m not sure what others think of an executive MBA but I think it is an MBA for those with the money to pay twice as much to be in school for half the time. It is the educational equivalent of shrinking the size of the box -- but instead of shrinking the price, the same the university doubles the price. Regardless of whether you agree or not, most students graduate better prepared to be president than an assistant brand manager. Another good source of food marketing education is seminars. Usually most of the seminars tend to be general with no specific industry targeted, but there are a few specialized ones. These are often expensive and paid out of the operations budget (rather than the benefits budget for education) and require executives to be out of the office. Given the environment of downsizing and budget cuts, even the most ardent student finds it hard to get the money or find the time. Occasionally a company would provide in-house education (not just training) for executives. I think the lack of depth of understanding of food marketing leads to a lack of innovation and not just product innovation but marketing innovation. Much of the current marketing innovation has come from the technical side “forcing” marketing innovation. So, what can be done? First, food companies must recognize their employees are a rich asset and can be the advantage they have over competition. They must stop spending money on employees’ education just because it is a fringe benefit to the company but instead because it is a marketing advantage to the company. Stop hiring better educated marketers and make better marketers through education! This chain now experiences staff turnover of less than one-third of the industry average at lower levels and almost none at the higher levels. The cost savings from recruiting alone would pay for the educational program. And this company is one of the most profitable and innovative chains in the industry. Billy Joel left some very good clues for all of us. Competent people have long-term success. Food companies are nothing more than the people that run the company, and competent people make profitable decisions. Just like Billy Joel produces hits year after year and still draws some of the largest audiences, our food companies can produce No. 1 hits with competent people. Market View: Have You Audited Your Marketing Efforts? 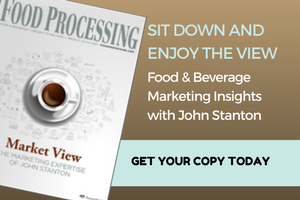 Marketing expert John Stanton offers advice on how to audit your company's marketing efforts.